Ever since Louis Braille adapted his “Braille Tablet” to write his system, people have been bothered by the downward writing involved in using a braille slate and stylus. 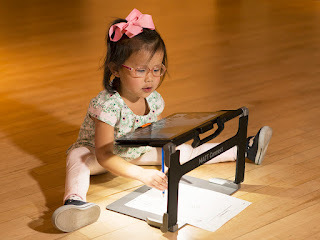 In order to read braille that you write on a standard slate, you have to turn the paper over, so you have to reverse both the direction you write and the characters as you write them. There have been a lot of different efforts to overcome this perceived deficiency, but I’m not going into that here. Our object this week is a Swail Dot Inverter, introduced by APH in 1965. 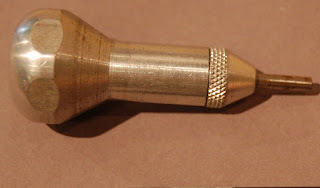 It is a humble little aluminum stylus with a faceted handle and a hollow tipped steel blade. When not in use, you can store the blade in the handle. It was designed to emboss raised dots, useful for constructing simple tactile graphics. You can still buy one! Although the Swail works with paper, it seems to give the best results with plastic Brailon paper from American Thermoform, which also appeared in the APH catalog for the first time in 1965.